Welcome to the ultimate article for meat slicer reviews. Whether you’re looking into something for the home or for commercial use, you will find all you need to know on this page. 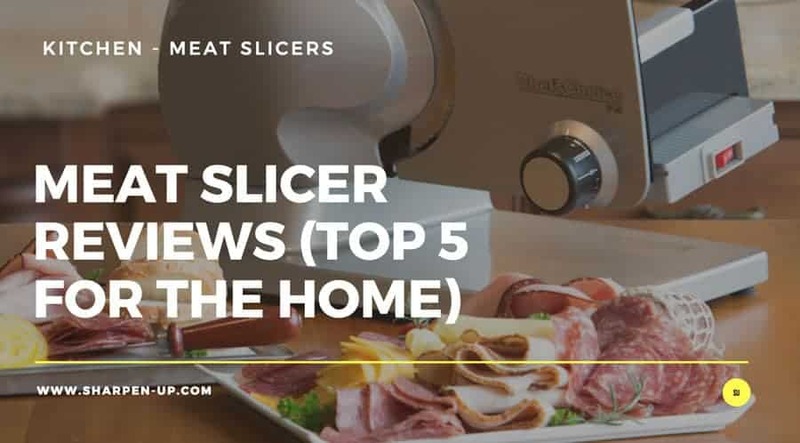 Below you can view our top 5 best meat slicers in each category, (home / commercial), along with a dedicated buyers guide and then a full review of each. Amongst all of that you will find lots of other handy info when it comes to buying a food slicer this Christmas. Ultimately, we want to make sure you purchase the right slicer for you. Okay, so you probably know these details already, but for the sake of clarity, a meat slicer is a very useful machine that you will have spotted in a commercial kitchen, or behind the counter at your local delicatessen. However, they are very useful kitchen appliance to have in the home too. A meat slicer for home use will make short work of slicing through a large chunk of deli meat, or parts of the chicken you have just roasted. 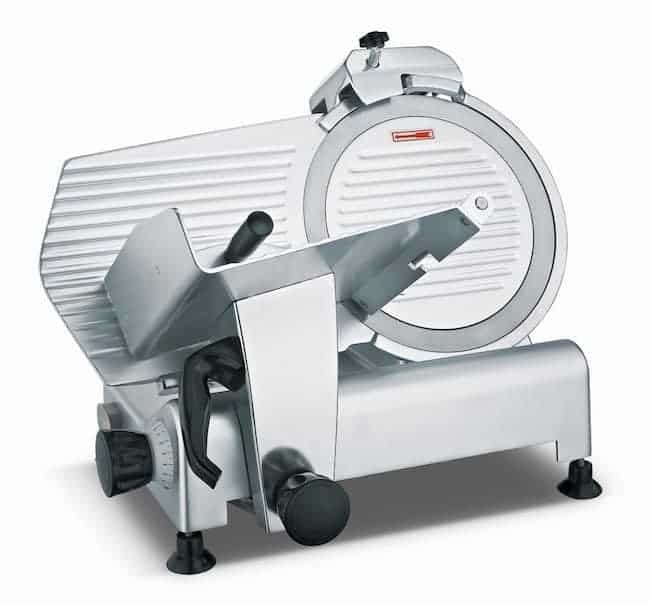 Utilising a saw-like mechanism, a meat slicer does exactly what it is named for – it makes thin, uniform slices of any kind of meat, cheese or vegetable you can safely place within it. There’s a number of good reasons to have a meat slicer in the home. The fact you have reached this page in the first place indicates that you are tempted to buy one. Let’s take a closer look at just some of the advantages of having a meat slicer for home use. 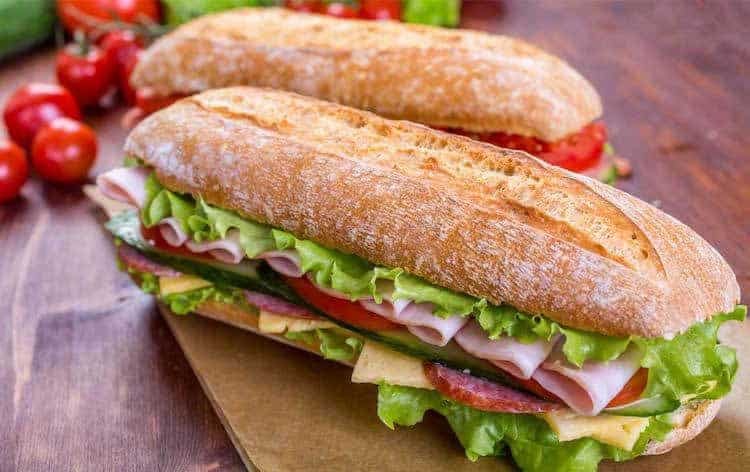 There’s no denying the fact that deli sliced meats and cheeses are more expensive to buy (in terms of poundage for money) than a larger non-sliced helping of the same food. With a meat slicer you can buy these larger more cost effective hunks and slice them at home. 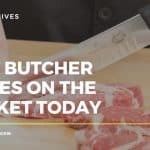 During a time of environmental concerns and the fact us humans desperately need to cut back on waste, a good meat slicer in the kitchen can help out more than you would imagine. Whenever you have leftovers it will be much easier to recycle the food into another, beautiful dish. If there’s some left over chicken, no problem, slice and dice and turn the waste into a tasty chicken pasta. If the family isn’t able to eat all of the Sunday roasted beef, gather up the remaining meat, switch on the slicer and knock up a lovely spicy beef stir-fry. With a meat slicer you are in the enviable position of being able to buy better, cheaper and more varied meat from the butcher. Let me explain. If you opt for a leg of lamb for example, and then debone it at home. Chill the meat in the freezer for an hour and then place it on the meat slicer, you have yourself some fantastic sized steaks at a fraction of the cost it would have been if you had bought them sliced from the butcher. Furthermore, it would be much more difficult to slice semi frozen meat using an electric knife or a butcher’s tool for instance. The left over money can go towards to some beef cutlets or chicken wings. More meat in the fridge, more choices for you. Who doesn’t love a toasted panini, or a delicious turkey sandwich. Any deli sandwich concoction you can dream up becomes a possibility with a meat slicer in the kitchen. Freshly cut meat slices will make excellent sandwiches that can be packed up in the children’s lunchboxes and taken to work too. And as we have mentioned above, because deli meat is cheaper when bought unsliced, you’ll be saving money in the long run too. It wouldn’t take long for the slicer to actually pay for itself this way. 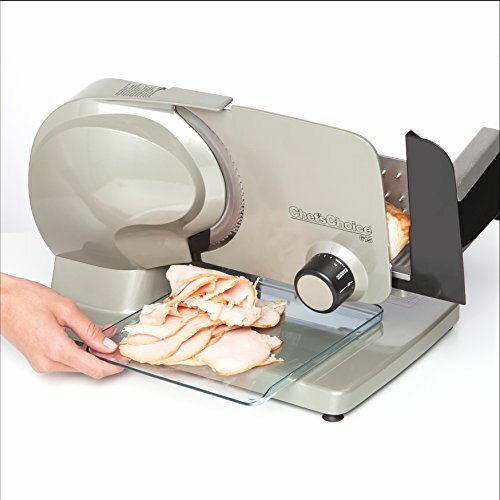 A rather obvious point to make maybe, but the best meat slicers for home use will make wonderful, (and uniform) thin slices of everything from your steaks to potatoes for fried chips, even parma ham can be shaved into gossamer thin and extremely delectable, translucent pink slivers that will look and taste awesome when served. 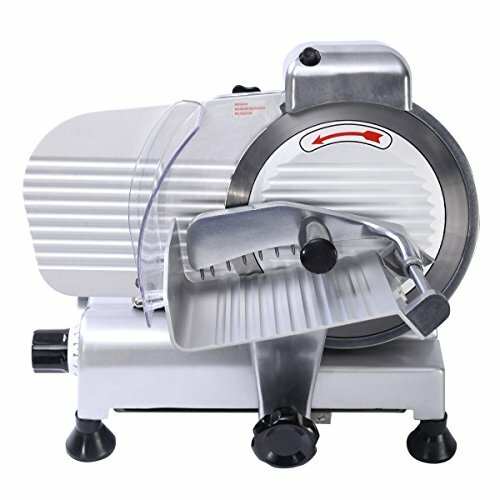 When you own a quality meat slicer there is no end to the types of foods you will be tempted to run through it. If you have a relative with arthritis in their hands and wrists, or maybe you are having joint problems yourself – a meat slicer can really help here too. A simple to operate slicing machine can be life-changing in situations like this. 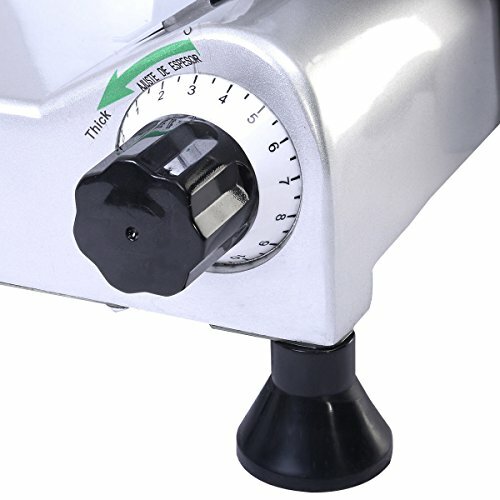 Taking the pain and the time out of slicing simple meats and vegetables and allowing the user to carry on independently preparing their own dishes. Finally, there is the time saving issue of owning a meat slicer that will appeal to everyone. Whether preparing food for the whole family or prepping food for the freezer, when using a knife (even an electric model) may take several minutes to slice up the ingredients, a meat slicer will do the same job in seconds. Before we get to the meat slicer reviews, there’s a few issues you should consider when looking to buy one of these handy machines. First there are the different types available; there’s the more expensive powerful models designed for commercial use, and there is of course smaller, less powerful slicers that are used in the home. Let’s break it all down and look at the various components that make up the best meat slicer. To really enjoy the convenience of owning a meat slicer, you need to have one that is up to the job. If you expect to make juicy steaks from large slabs of meat, you need a slicer with a powerful enough motor. The fact is, if you scrimp on this, (and go for a cheaper model with smaller motor) you will be hindered in the types of slicing you can do. A budget model just won’t cut it, (excuse the pun). While at first thought you would think that plastic would not be a good material for gears within a meat slicer, (prone to cracking and the potential for melting under heat strain), this is not the case. Many meat slicers for the home utilise plastic gears because they are lightweight and more durable than you would imagine. Additionally, plastic gears are smooth and if well maintained allow for fluid operation of the main saw. So if the meat slicer you have your eye on is built using non-metal components you can rest easy, it will still be up to the job. Another variable to consider is weight. For instance, the stronger motor will make for a larger more studier unit, which is what you need when slicing big chunks of meat. If you opt for a professional grade model you will need plenty of counter space. The commercial meat slicers you see in deli’s are permanent features, they are much too heavy to be dragged in and out of a cupboard as and when you need it. That’s why most of you reading this now will be in the market for a meat slicer for home use. However, even though these are smaller and less heavy than a commercial model, we recommend that you have the space for it. To be able to leave your slicer on the worktop ready for whenever you need it, will ensure that you get the most out of owning one. Most slicers for the home will have a blade size ranging between 7 and 10 inches. It is worth considering the types of slicing that you plan on doing before you buy. A larger blade will be better suited to coping with tough, larger chunks of meat for instance. Like all utensils in the kitchen, they need to be cleaned thoroughly after use. 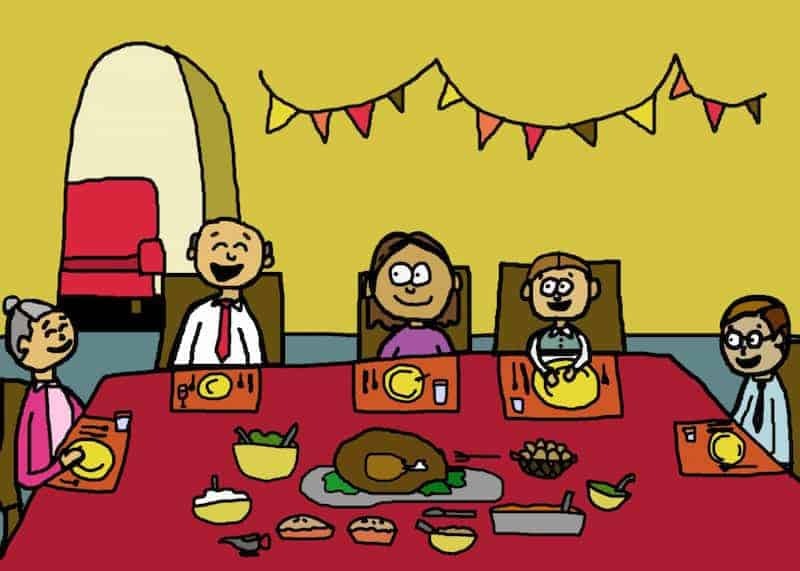 If you allow for nasty bacteria to take hold, you will be putting your family at risk. And while some meat slicers will be more difficult to clean than others, (a serrated blade will take longer than a smooth blade machine for instance), common sense really is the go here. 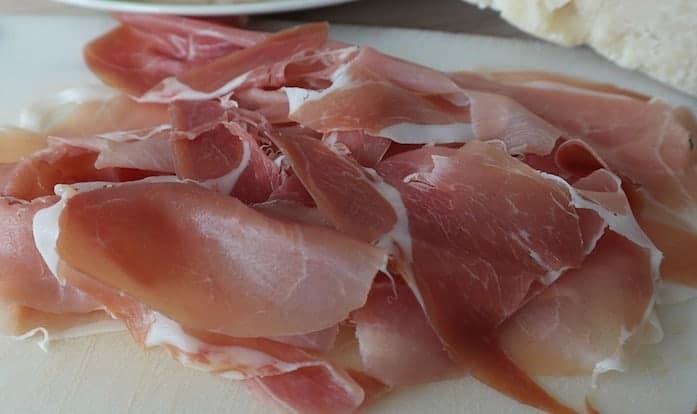 If you’re just slicing a few pieces of ham, a simple wipe with an antibacterial cloth afterwards should do the trick. Unfortunately, most meat slicers do not come with both a serrated and smooth blade as standard, they ship with only one or the other. You can buy a back up blade to cover both bases, however, you should ensure that the mechanism to swap the blades is easy and convenient to use. Every time you pull the slicer apart for a really thorough clean, you should add a little food grade machine oil. Again, take note of how easy the machine is to dismantle before you buy. Here you want something simple to maintain. 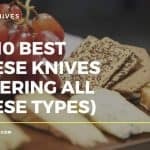 Chef’s choice hardly need any introduction from regular readers of Sharpen-up, their vast line of electric sharpeners, and other tools within the kitchen are highly popular. It is no surprise that their contribution to the world of meat slicers is also so well regarded. They actually have a few meat slicers available, however we have chosen the 615 premium electric food slicer above all others as it balances power and affordability in one great, meat slicer for the home type package. First off, the 615 is built to last. 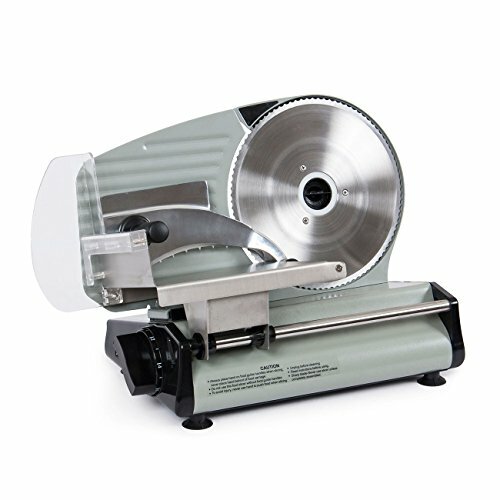 The main components are made of cast aluminum and stainless steel for superior longevity, and reliable performance for a wide range of slicing tasks. Inside you have a powerful, high-torque electric motor, that provides smooth and consistent force for slicing with ease and confidence. The multi-purpose 7-inch stainless steel blade will make short work of those slabs of meat, cheeses and pretty much anything else you place in its path. The capacity is great too, ranging from deli thin slices right up to 3/4-inch thick slices. That’s basically professional grade slicing in a tool you can have (and afford) in the home. Importantly, the Chef’s Choice 615 features an easy clean design. The blade, food carriage as well as the food pusher, food deflector and thickness guide plate all come apart for simple maintenance. There’s a couple of nice design touches too, (when you’re dealing with a company that has multiple food slicers in the space, and have been manufacturing both home and commercial food slicers for a number of years, it’s clear that they will know what they are doing). A special button on the unit secures the food carriage into a locked position. This adds a level of safety by limiting access to blade when the machine is not in use. Another great little feature is the slicer’s intermittent on/off switch. There’s also a handy cord storage for extra tidiness. For those where counter space is an issue, the dimensions of the 615 come in at: 15-1/2 inches in length, 10-3/8 inches in width with a height of 11 inches. To top it all off the machine comes with a 1-year limited warranty. Rugged design with durable aluminium and stainless steel construction. Reliable motor with smooth and consistent power distribution. Easy clean – most components can be removed very simply indeed. As far as meat slicers for the home, the 615 is at the higher priced end of the spectrum when compared to others in our top 5 list. In all the meat slicers reviewed here, the 615 does balance high build quality with performance in a way that is hard to beat. Well worth considering if you’re after one of the best meat slicers money can buy for your home. The Arksen 8.7 inch electric meat slicer is a versatile little appliance that packs quite a punch. 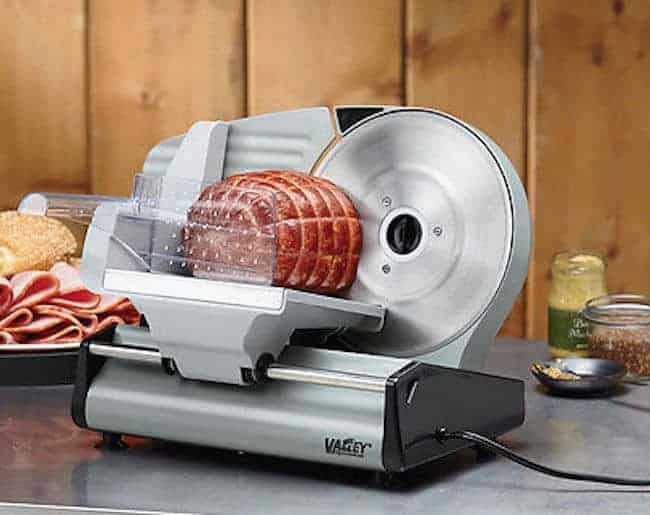 While containing a smaller motor than others in our list (at 110 v), you will still find yourself slicing through meat and vegetables in your kitchen with such ease, you’ll be more than happy you opted to buy one. The thickness capacity ranges from deli thin up to 5/8 inches thick, while the 8.7 inch stainless steel blade performs well considering its size, (a 10 inch variation of the Arksen is also available). 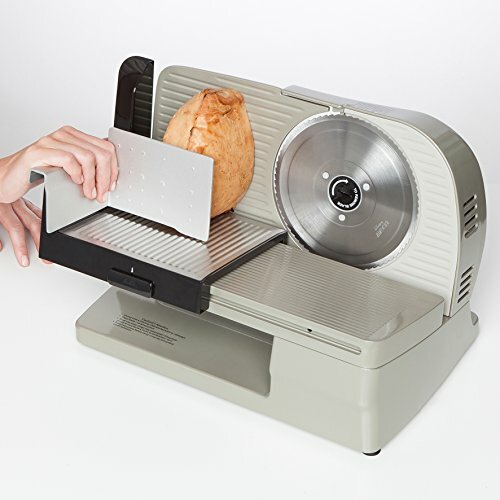 (Be wary of the Amazon description that states the slicer can cut through frozen slabs of meat. This is not advised, and the Arksen manual even warns against it). 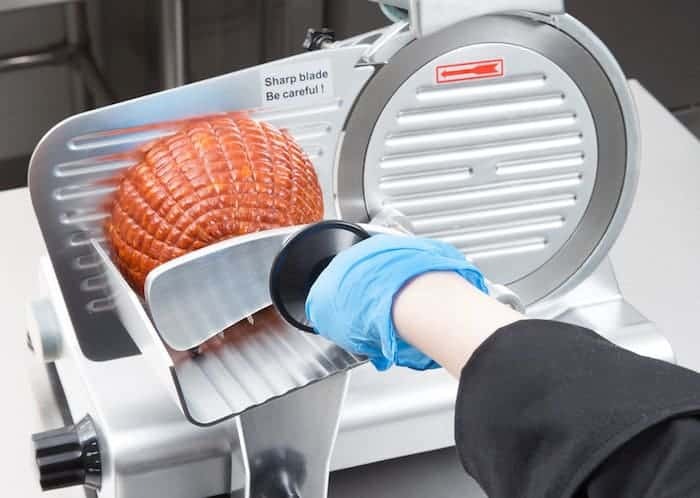 The well-designed sliding meat carriage ensures the uniformity of cuts, while ensuring your hands are safely away from the blade as you work. Arksen boast that the appliance meets or exceeds all CE, ETL, CSA standards, (great for peace of mind). Extra stability is gained from the suction feet located beneath the unit. Overall dimensions come in at 17 inches wide, 9-1/2 inches in length and 11-1/2 inches high. Suitable for most kitchen worktops we think you’ll agree. The fact this is only a 110 volt appliance will put those off that require more power under the hood. The description in Amazon states that this can cut frozen meat. The unit manual states otherwise – if you do buy the Arksen, ensure you know exactly what you can and can’t do with it. The Arksen is a great mid-range powered option for the home. 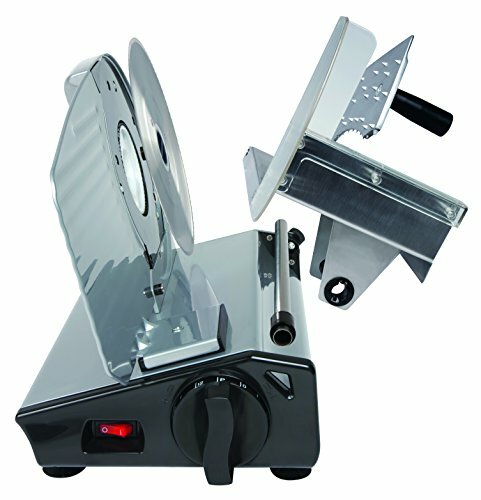 Ideal for general use rather than for daily slabs of thick meat; this is a good option for those starting out with their first meat slicer. Anyone needing the extra power should look elsewhere however. While the Nesco name might not jump out at you as being the most well known manufacturer of kitchen appliances, do not let that put you off. What we have here in the FS-250 is an excellent meat slicer that performs very well indeed. Under the hood you have a high-powered 180-watt gear motor. This provides a more than adequate blade velocity, for slicing tasks within the home. 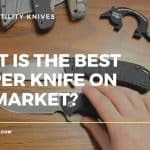 The build quality is deceptively good, with a full stainless steel utilized for the sliding food carriage and hardened stainless steel being used for the 8.7 inch serrated blade. To top it all off, the food press has been manufactured with die cast aluminum. 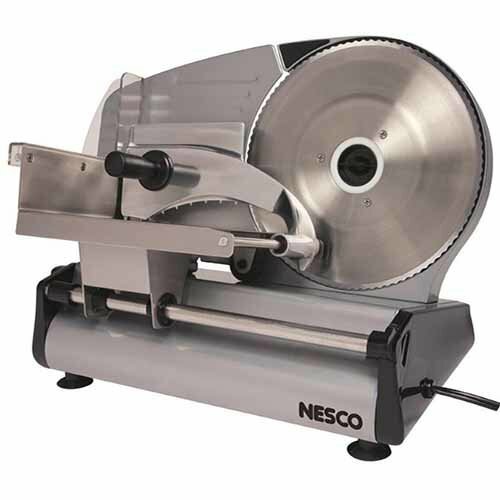 Like the Chef’s choice meat slicer reviewed above, the Nesco has a couple of pleasing little features that make it worthy of our list. 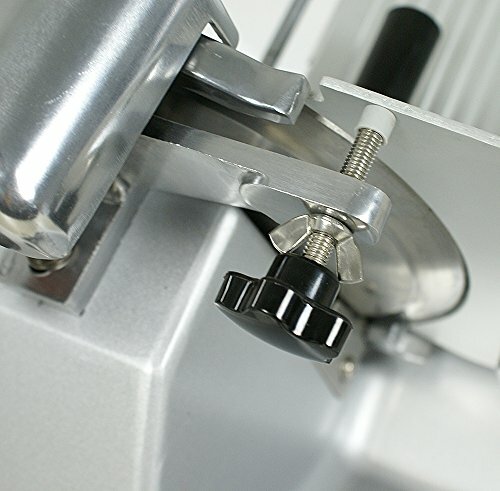 The adjustable thickness control is very easy to operate, allowing for precision depth manipulation relative to the size of your ingredients. There’s also dual safety features built in, and like all good meat slicers, you can remove the various components with ease when it comes to the all important clean up after use. Lacks a few of the features that make the Chef’s Choice such a formidable player in the space. 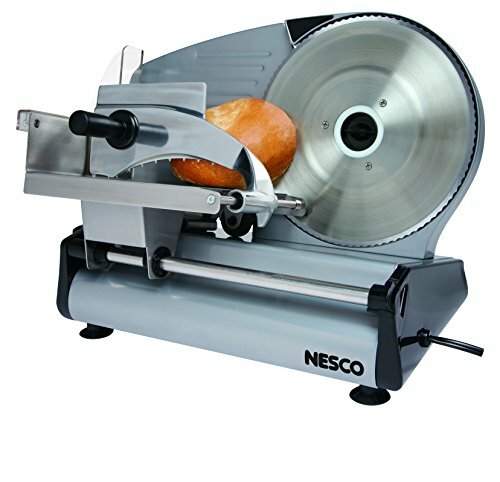 The Nesco really is a great meat slicer for the money. 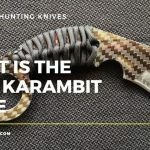 Although it might not have the brand name might (and some of the manufacturing prowess) of others in our top 5 list, it is still well worth a look. Highly recommended. 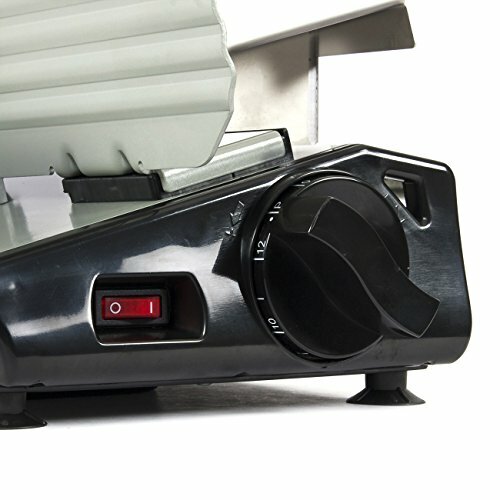 From the little heard of Nesco, we go to an even lesser known model here: The Valley Sportsman, 8.7 inch stainless steel electric food slicer. This is another tool that makes our top 5 best meat slicers for a reason. It is a damn good unit. 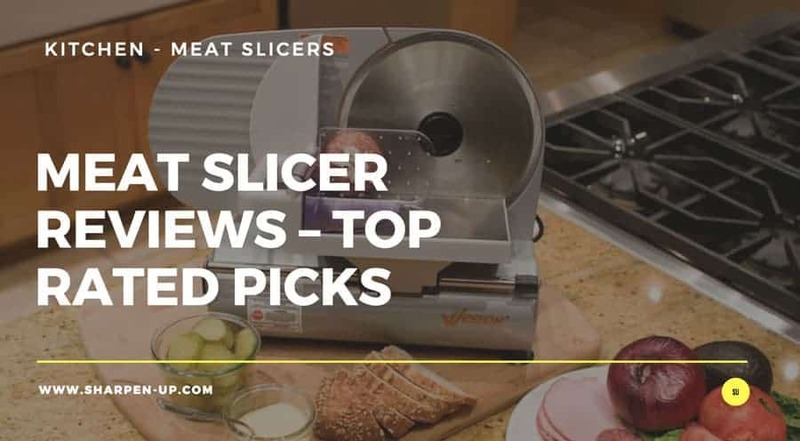 This versatile slicer contains many of the features we have raved about in our previous meat slicer reviews: first off there’s a reliable 180 Watt AC power sitting under the hood. You’ve also got a built-in, side adjustment system and components made out of durable stainless steel. When it comes to the clean-up, they have taken a leaf right out of the general meat slicer handbook, and made everything easy to remove and maintain. 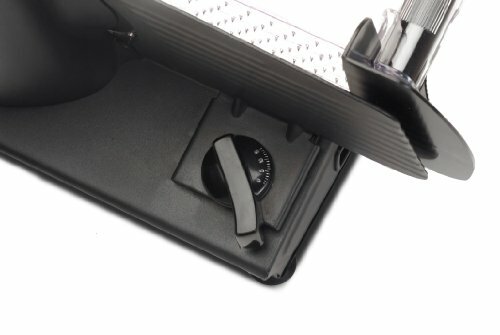 For extra sturdiness on your kitchen worktop there’s even a series of nonslip feet built onto the underside of the unit. 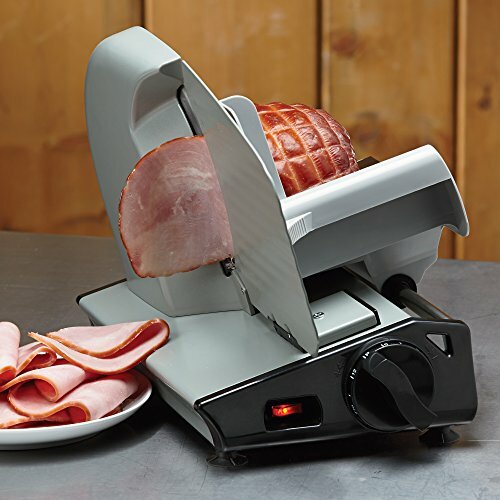 Whether you after deli-thin ham to slap between some bread, or you’re looking to cut up chunks of meat (up to 9/16 inches thick), this handy meat slicer will be up to the job. While this unit is not attached to any well known brand, the trade off is that unknown quantity of customer support. – Users have not complained of this, however in the event anything goes wrong, tracking down the right people for a free replacement is likely to be more difficult. A great unit at an even better price. 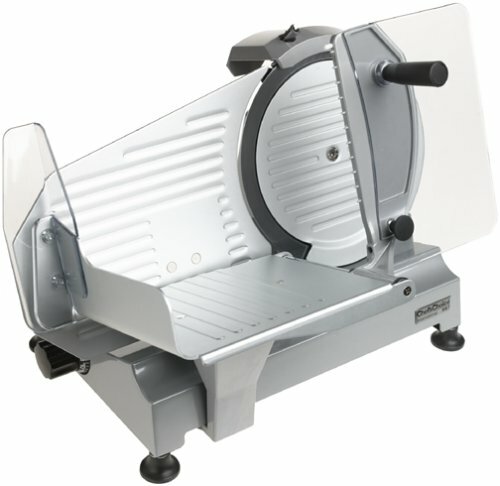 If you need a no fuss affordable solution to your meat slicing needs, this could be your answer. Check reviews before you buy to see for yourself. An appliance doesn’t have to come from a well known brand to be good. 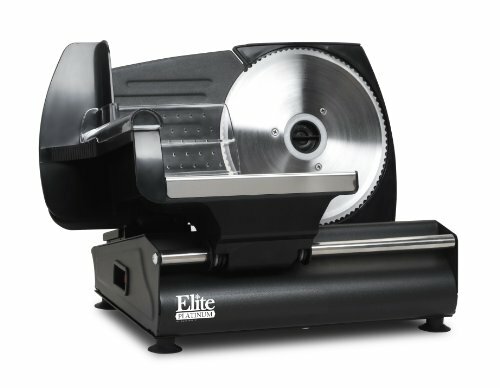 The Elite Gourmet EMT-503B Maxi-Matic is a sleek looking meat slicer that will look great in any contemporary kitchen. 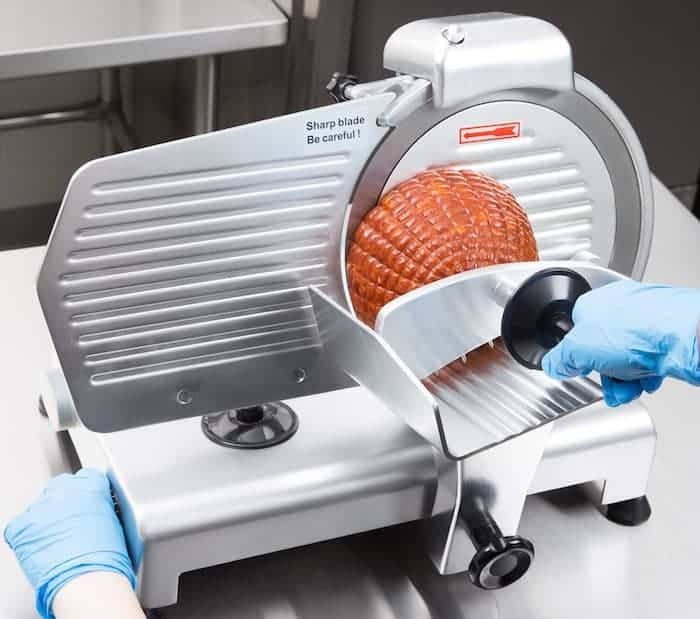 The slicer features a removable and retractable 7.5″ stainless steel blade, (complete with On/Off switch to ensure safety while you work). Like all good meat slicers you can adjust the cutting width from deli-thin slices up to ½ inch thick. The die cast aluminum housing is robust enough, however some users have complained that some of the plastic components that make up the appliance are weaker than you would expect, (the plastic ‘food pusher’ being one area that has caused complaint). For easy cleaning the various components do come apart, however if you opt for the serrated blade model, you may find small bits of meat within the teeth of the blade when it comes to the clean down, (a regular issue with serrated blade slicers). The ample sized slicing platform is great for home use, and all the stability you need is assisted with rubber feet beneath the unit. It really does look great. The design of the unit is definitely pleasing on the eye. Some of the components are plastic and this has caused issue for a minority of uses. If things do break, some user have complained that it is difficult to get hold of the manufacturer for speedy replacements. The Elite Gourmet EMT-503B Maxi-Matic has some nice touches and is designed to look great. With moderate performance, power and blade size it will tend to the majority of slicing tasks, but you should go easy on the tougher cuts. Some users have had issue with the overall build quality and after sales service, so bare this in mind before you buy. 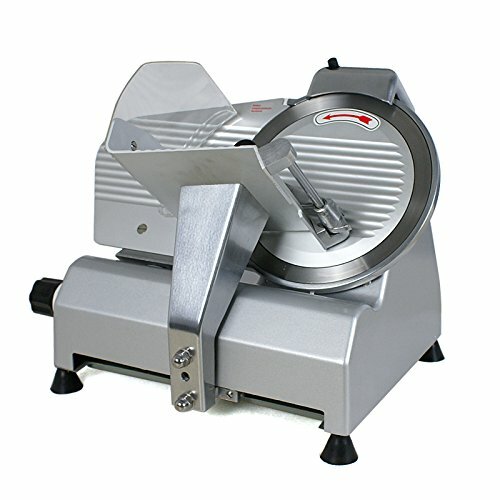 The typical meat slicer will be able to help you choose the thickness of your meat as well as cut it. 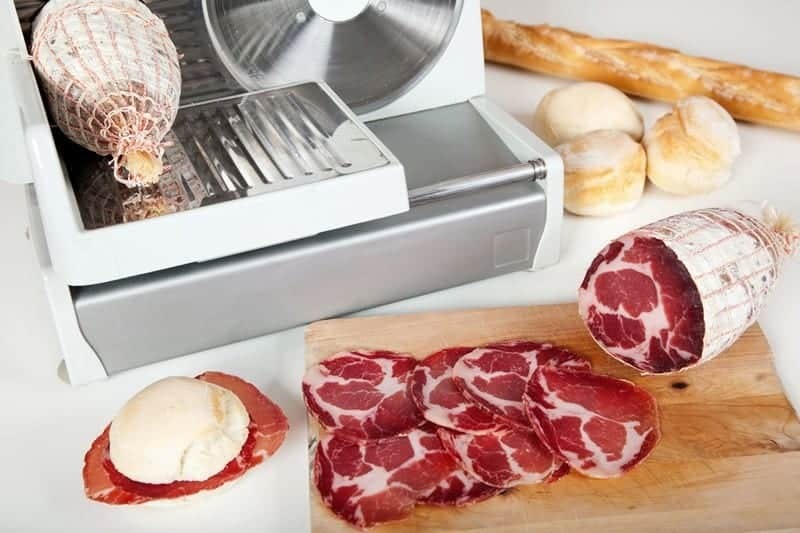 It consists of a blade with which the meat is sliced as desired, the thickness guide and the thickness control that define the thickness of the meat, a food tray that holds the resultant slices and a power cord that connects the machine to power and makes it all happen. 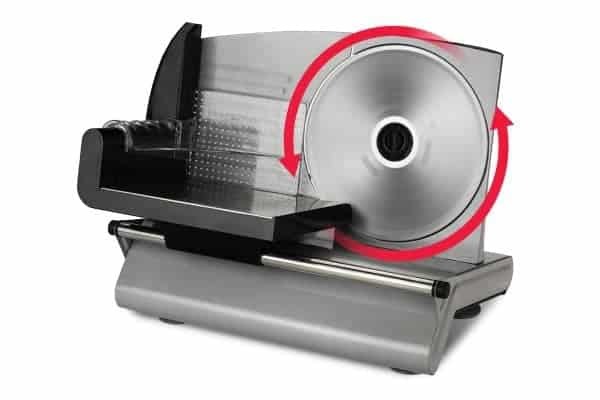 The meat slicer’s blade is very sharp, and operates at very high speed spelling doom for any body part that comes in contact with it while it is in action. A lot of caution must be taken when using this machine. Before starting out with a meat slicer, you should go through the instruction manual thoroughly. If it is your absolute first time, (in a commercial setting) you should watch another co-worker in action and ask any questions you can think of before trying to use it yourself. If possible, ask for training from your employer before attempting to use it. When working in a commercial setting you should be wearing cut resistant gloves when using a meat slicer. This should be a part of your company’s health and safety policy. This will also help with hygiene issues too. When working in the home, the choice to wear gloves is entirely up to you. 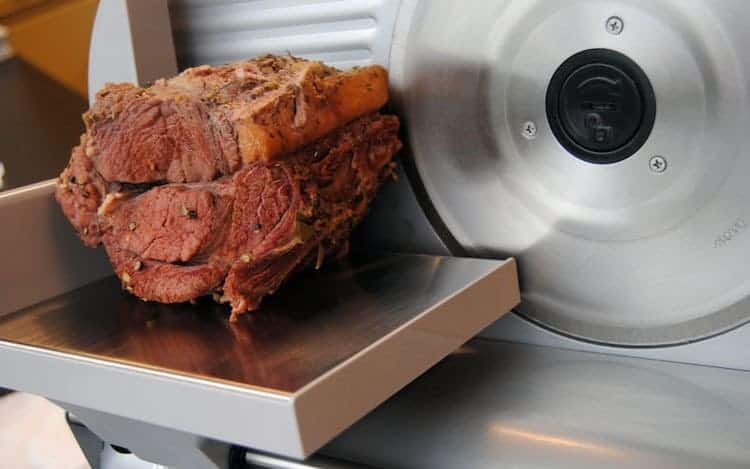 If you have them, it is a worthwhile safety precaution, especially if you are dealing with larger slabs of meat with a slicer that is close to commercial level performance. This one is a nod to common sense. Anything that could obstruct your movement whilst working with the meat slicer should be put away. Avoid distractions when using the meat slicer. Do not hold a conversation while the machine is running. If you must talk, put the machine off and finish your conversation. Another point that maybe stating the obvious, however it is amazing how many operators will cut corners in the pursuit of speed, (especially in a commercial setting where it is easy to take safety for granted). Before you begin using the meat slicer ensure that all the relevant safety guards are in place. If your machine has speed controls, always start on a slower slicing speed. This is known as locking the blade. Set the thickness to zero after you are finished-do not leave the blade open. On the machines that have blade secure lock systems, make sure these are engaged after you have finished using the slicer. Your hands should not be used to stop the meat from being sliced. That’s what the on/off button is for. After you have finished with the machine, turn it off at the switch and then un-plug it from the power supply. No ifs and buts! Follow these tips for proper and safe usage of your brand new meat slicer. 1. Pull the carriage towards you. Place the meat in the carriage and make sure it fits securely. 2. Select your slice thickness, plug in the power, and hit the on switch. 4. When you are done slicing, hit the power switch and un-plug the machine. Wait for the blades to stop spinning. 5. Close the blades, by setting the slice thickness to zero. In order to maintain proper hygiene, you are going to have to clean your meat slicer thoroughly. 1. Put on your cut resistant gloves and then pull the vinyl gloves over them. 2. Turn off the machine at the plug, and then push the carriage away from the blade. 3. Dismantle the carriage if it is screwed in place. Wash it with hot water and soap in a deep sink. Next, you apply appropriate sanitizer. 4. Unscrew the fixing pin screwed into the back of the machine, that holds the back of the blade, to enable you clean behind the blade. 5. Clean the blade by using strokes that start at the center and move outwards and away from the blade edge. Do not try to clean the blade by moving your hands along the edge. Sanitize the blade appropriately. 6. Remove the blade using the blade removal tool. Keep the blade removal tool aside while you clean the extracted blade: strokes from the center outward. The meat slicer’s blade may be dangerous to touch, but you want it to remain so. Knowing how to sharpen your meat slicer is an important skill to master. But before you attempt to do so, you should put on your cut resistant gloves and vinyl gloves. 1. Unscrew the sharpener fixing bolt attached. Flip the sharpener unit 180 degrees and refit. 2. Plug in the power to the meat slicer. 3. Press the back sharpening button for 30 to 40 seconds. To remove the burr, press the front button for 3-4 seconds. 4. When through, hit the off switch and un-plug the machine. 5. Turn the sharpener unit back 180 degrees and refit. 6. Clean and properly sanitise your meat slicer after every sharpening session. 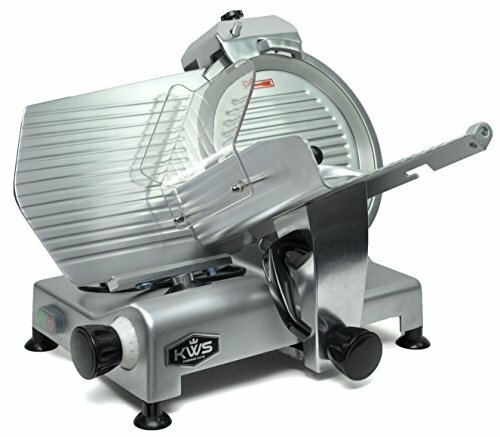 The KWS Premium Commercial is a beast of a meat slicer with a 420w motor purring away under the hood. But when you have a 12 inch stainless steel blade spinning around you need that power to take on the big cuts. 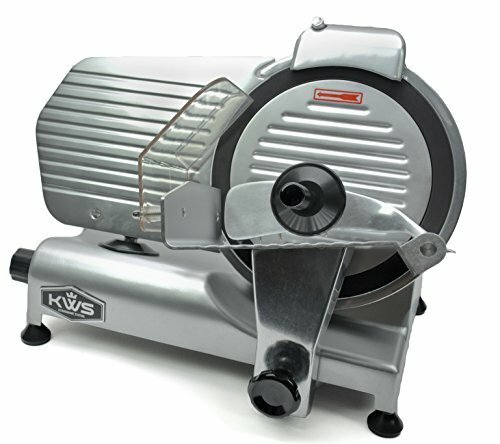 Specifically designed for commercial use in restaurants, butcher shops, delis and farms, the KWS is a machine purpose built for daily use in demanding working conditions. The MS-12N 12” also has a fantastic cutting range. It can be adjusted using the numerical scale knob with precision accuracy, right up to a thickness of 0-0.6”. KWS are a well known for the consistency of their output, and real thought has gone into the MS-12N. 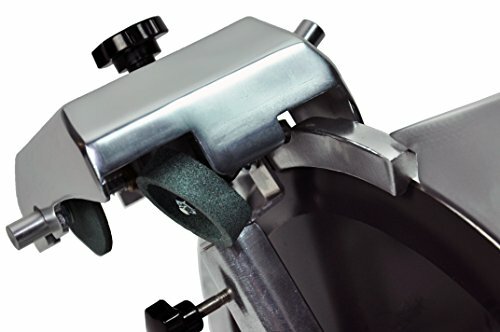 Knowing that the slicer needs to keep on working, day in, day out, the manufacturers have provided a very efficient sharpening system, via the built-in dual whetstones. This is easy to operate within the machine and will ensure your blade keeps in tip-top condition. They have also incorporated a ring guard assembly system. This helps to keep a razor sharp edge on the blade, as well as make the whole setup safer to use. 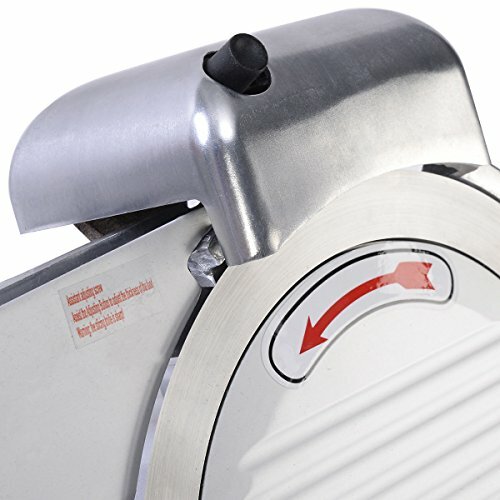 As you would expect from a commercial meat slicer of this standard, the unit is ETL, NSF, and FDA Approved. At the higher end in terms of price when compared to the competition . 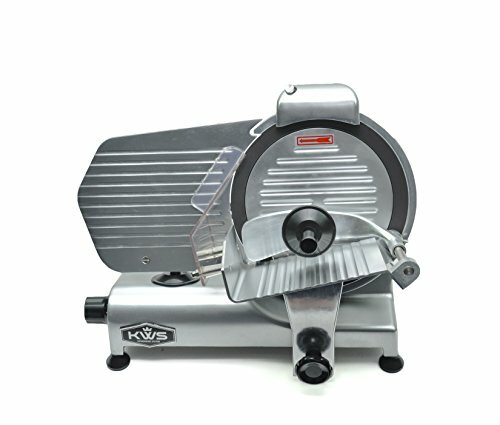 The KWS gets our top rated commercial meat slicer pick because it is such a well-built machine. Buy one of these and you will have a unit that will last you years. The precision control and overall performance level are difficult to beat; one of the best commercial meat slicers on the market today. 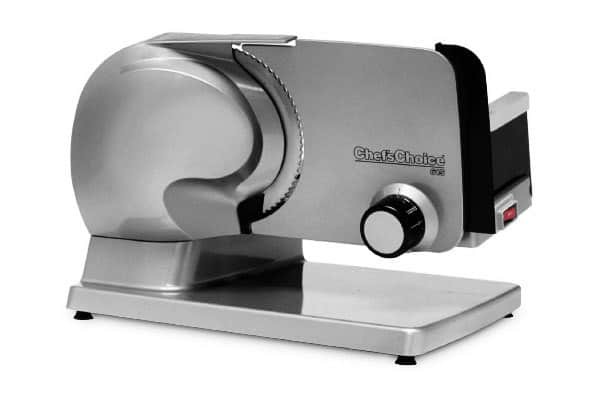 It would be remiss of us not to include an offering from Chef’s Choice in our top 5 best commercial meat slicer reviews. While they have a number of models in this category in the market, the 667 makes the list for its sheer rugged construction and performance level. The unit is built like a tank and that is exactly what you need from an appliance getting regular use in a commercial kitchen. While the blade size isn’t in the same league as the KWS, (this particular model sports a 9.8-inch diameter fully hardened, fine edge, stainless steel blade), the machine will still handle a wide variety of tasks. This capacity is helped in part by the large, fully-retractable carriage and tilted design. Big hams, roasts, and blocks of cheese can all rest in the belly of the 667 and will be cut with a level of precision you need. And with a powerful, high-quality induction motor with a peak power of over 1/4 horsepower, even the hardiest of ingredients stand little chance in the face of the 667. It’s not all brute force however. To ensure stability and safety as you work the unit has rubber feet and features thick Plexiglas guards to shield the carriage and the food pusher. For increased longevity and ultra reliability there’s also inbuilt ”on-demand” blade sharpening and maintenance. When you are talking commercial grade use, some may prefer a blade size in the double digits. 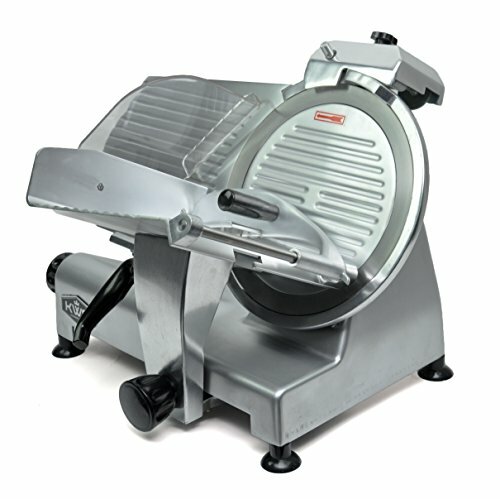 The Chef’s Choice 667 is a top-level commercial meat slicer that has proved popular for a number of years now. However, if you are after really heavy duty slicing, you might want to opt for one of their bigger more powerful offerings, or take a look at the KWS instead. 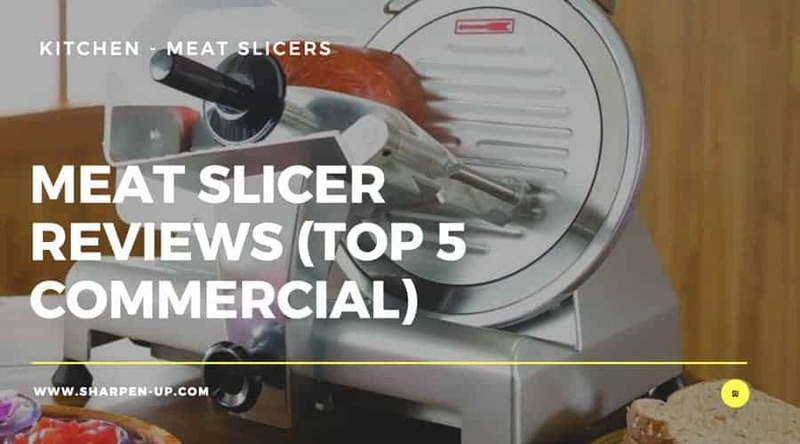 The Giantex blade meat slicer is a good option for smaller restaurants and delis that do not require the power and blade size of some of the other larger machines reviewed in our top 5 list. In short, this is more diminutive offering, (8 inch blade with a 120 w motor) housed in a robust commercial quality meat slicer. (Larger sized models are available however). The unit features a semi-automatic operation, which the manufacturers boast to be highly efficient with energy saving benefits. 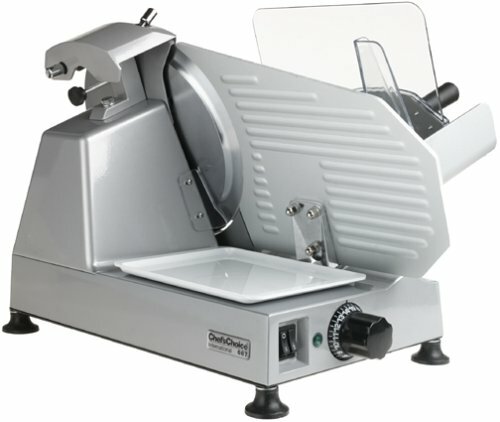 A wide variety of food types can be placed onto the Giantix, with its slicing capacity of 0-0.47″. 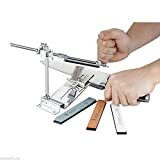 There’s also the standard commercial grade sharpening control system, which involves the whetstones sharpening both sides of the blade. The only con is that this will not have the power that all kitchens require. Safe and easy to use, the Giantix is actually a great cross over unit that can be used in both the home kitchen and smaller commercial premises. Highly recommended. 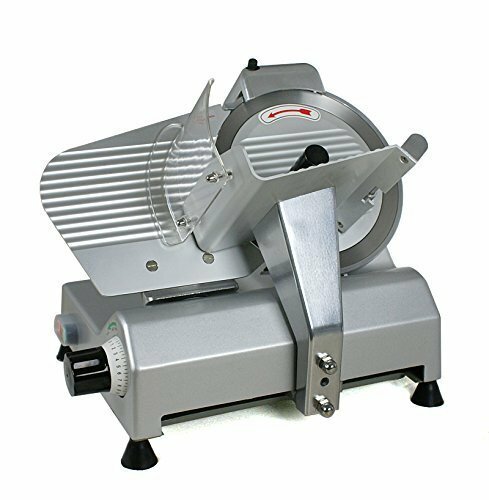 The pro 10 inch meat slicer is a great option for those that don’t need the high power of our top pick KWS, but still require more than what is offered with the Giantex. What you get is very much what is said on the tin. 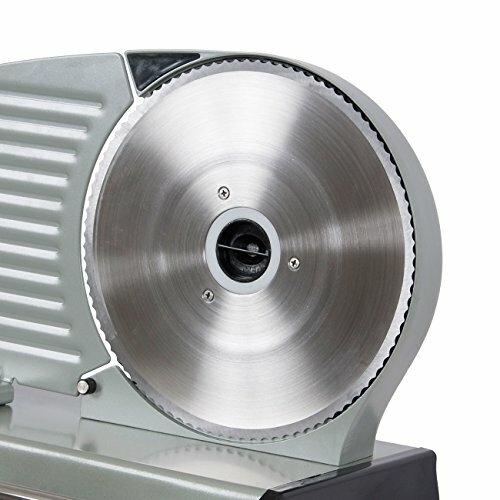 A reliable 240 w motor (working at a more than adequate 530RPM), powers a stainless steel 10 inch blade with an end result that will make short work of your meat, cheese and vegetable. The manufacturers have opted for a fashion tilted design for what they claim results in fast and labor-saving slicing. Slicing capacity is good too, with the easy to adjust numerical scale knob allowing for precise cuts between 0 to 17mm in width. The design features two baffle plates and a stainless steel device that reliably fixes the meat ready to be sliced. 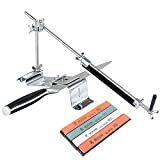 There is also the very handy built-in dual whetstone system for sharpening the blade on both sides, safely and conveniently. Doesn’t have the motor size of our top pick KWS. For those that don’t need the power of our top pick KWS, this 240w option may well fit the bill. Sturdy with nice safety features, this will make a worthwhile addition to any commercial kitchen. Highly recommended. Another great meat slicing option from KWS. Very similar to our best commercial meat slicing pick, this is a slightly paired down 320w version with 10 inch blade. The same prioritization towards superior build quality is evident here too. The blade is made from Teflon stainless steel for extra longevity strength. 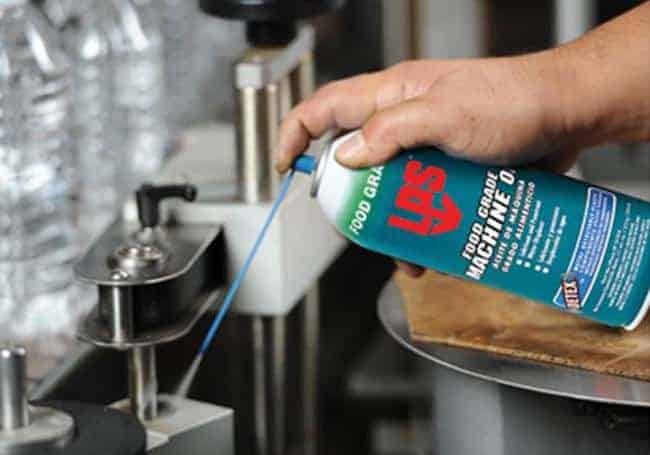 Cutting thickness will please many users, with the width ranging from 0-0.4 inches. The same dual whetstone sharpening system is all there, as is the aluminium body for increased durability and anti-corrosive properties. The unit is ETL, NSF, and FDA Approved of course. This KWS meat slicer could easily have gained our number one spot. It is the same build, just with the smaller motor and blade. If those specs suit your needs, what are you waiting for? 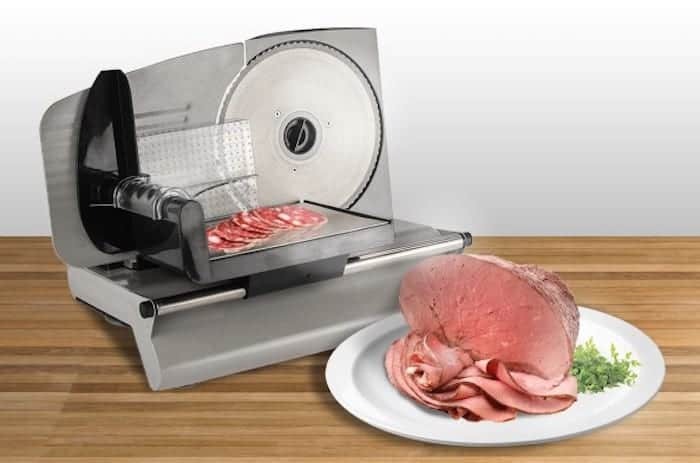 This is the meat slicer to buy.